More than 3.5 billion years ago, a meteor slammed into Mars near its equator, carving a 96-mile depression now known as Gale Crater. NASA’s Curiosity rover landed in the Martian crater known as Gale Crater, which is approximately the size of Connecticut and Rhode Island combined. A green dot [? ]shows where the rover landed, well within its targeted landing ellipse, outlined in blue. 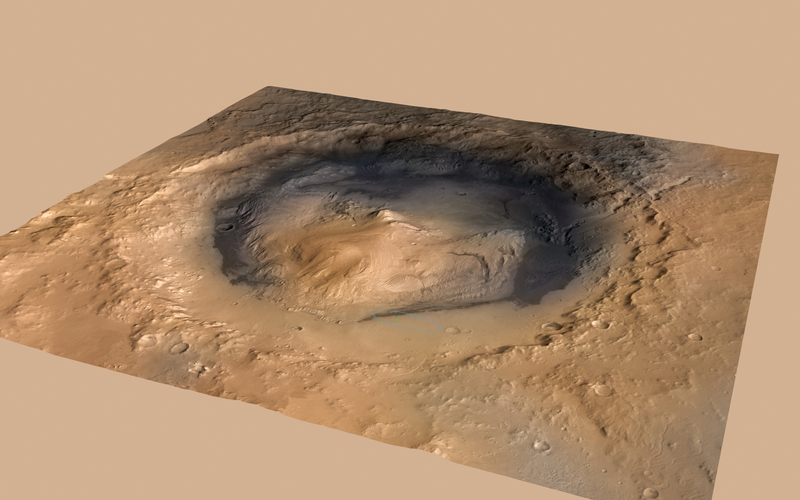 The image combines elevation data from the High Resolution Stereo Camera on the European Space Agency’s Mars Express orbiter, image data from the Context Camera on NASA’s Mars Reconnaissance Orbiter, and color information from Viking Orbiter imagery. There is no vertical exaggeration in the image. That was unremarkable. Back then, Mars, Earth and other bodies in the inner solar system were regularly pummeled by space rocks, leaving crater scars large and small. What was remarkable was what happened after the impact. Even though planetary scientists disagree on exactly what that was, they can clearly see the result: a mountain rising more than three miles from the floor of Gale. More remarkable still, the mountain is layer upon layer of sedimentary rock. The layered rock drew the attention of the scientists who chose Gale as the destination for NASA’s Curiosity rover, a mobile laboratory the size of a Mini Cooper. 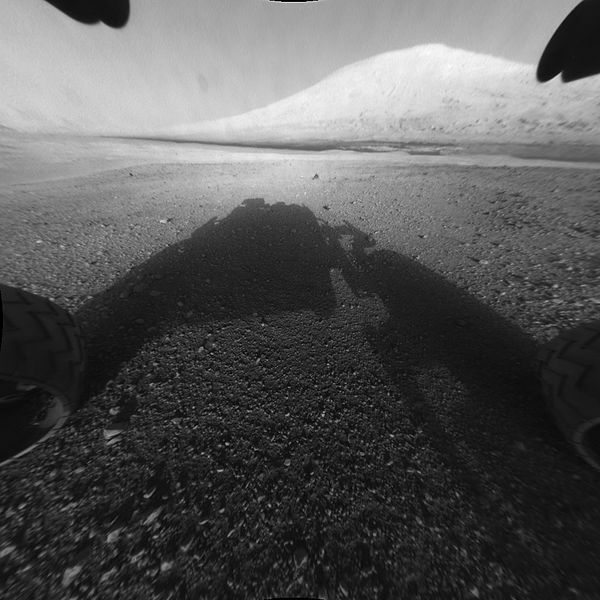 Now, more than two years after arriving on Mars, Curiosity is climbing the mountain. Officially, the name is Aeolis Mons, but mission scientists call it Mount Sharp in homage to Robert P. Sharp, a prominent geologist and Mars expert at the California Institute of Technology who died in 2004. On Earth, mountains rise out of volcanic eruptions or are pushed upward by plate tectonics, the collision of pieces of the planet’s crust. 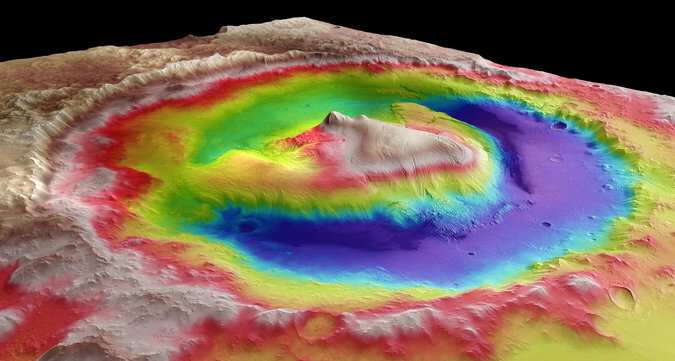 Mars lacks plate tectonics, and volcanoes do not spew out of sedimentary rock. So how did this 18,000-foot mountain form? In the late 1990s, NASA’s Mars Global Surveyor spacecraft was sending back images of the Martian surface far sharper than those from earlier missions, like Mariner and Viking. Kenneth S. Edgett and Michael C. Malin of Malin Space Science Systems, the San Diego company that built Global Surveyor’s camera, saw fine layered deposits at many places on Mars, including Gale. In 2000, they offered the hypothesis that they were sedimentary, cemented into rock. Indeed, Dr. Edgett said, it appeared that Gale Crater had been fully buried with sediment and that later winds excavated most of it, leaving the mountain in the middle. Imagine carving out of an expanse as large as 1.5 Delawares — a mound as tall, from base to peak, as Mount McKinley in Alaska, the tallest mountain in North America at 20,237 feet. Dr. Edgett asserts that that is plausible on Mars. He points to other Martian craters of similar size that remain partly buried. “There are places where this did happen, so it’s not ridiculous to think this is what happened at Gale,” he said. Still, in 2007 Gale had been discarded from the list of potential landing sites for Curiosity, because observations from orbit did not show strong evidence for water-bearing minerals in the rocks. NASA’s Mars mantra for the past two decades has been “Follow the water,” because water is an essential ingredient for life. Dr. Grotzinger asked Ralph E. Milliken, then a postdoc in his research group at Caltech, to take a closer look at Gale. With data from an instrument on NASA’s Mars Reconnaissance Orbiter that can identify minerals in the rocks below, Dr. Milliken showed the presence of clays at the base of Mount Sharp as well as other minerals that most likely formed in the presence of water. “The fact we have this mountain, and it’s not all the same stuff — the mineralogy is changing from one layer to the next — that gives us the hope that maybe those minerals are recording the interaction of the water and the atmosphere and the rocks,” said Dr. Milliken, now a geologist at Brown. Were water conditions there becoming more acidic? Was there oxygen in the water? “That’s something we can assess with the rover on the ground,” Dr. Milliken said. and discovered geological signs that Gale was once habitable, perhaps a freshwater lake. After that, the rover drove to Mount Sharp, with only brief stops for science. To date, the rover, operated by NASA’s Jet Propulsion Laboratory in Pasadena, Calif., has driven more than six miles, taken more than 104,000 pictures and fired more than 188,000 shots from a laser instrument that vaporizes rock and dirt to identify what they are made of. In September, Curiosity drilled its first hole in an outcrop of Mount Sharp and identified the iron mineral hematite in a rock. That was the first confirmation on the ground for a Gale mineral that had been first identified from orbit. The orbiter also detected magnesium sulfate salts, which Dr. Milliken described as possibly similar to Epsom salts. That layer appears to be roughly as old as sulfates that NASA’s older Opportunity rover discovered on the other side of Mars. If Mount Sharp sulfates turn out to be the same, that could reflect global changes in the Martian climate. 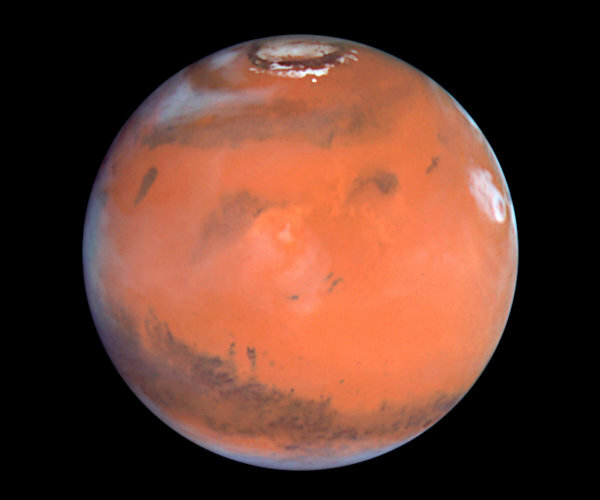 Or they could be different, suggesting broad regional variations in Martian conditions. He said the layers of Mount Sharp dip outward at the edges, as in an accumulating mound; they are not flat, as would be expected if they were lake sediments subsequently eroded by wind. Dr. Grotzinger thinks that both could have happened: that Gale Crater partly filled, then emptied to form the lower half of Mount Sharp, and a different process formed the upper portion. A sharp divide between the upper and lower parts of the mountain is suggestive. On Monday, during a NASA telephone news conference, Dr. Grotzinger and other members of the science team described new data suggesting long-lived lakes in the crater. The deposits at Yellowknife Bay could have been part of an ancient lake filled by streams flowing from the crater rim. As Curiosity drove toward Mount Sharp, it appeared to be traveling down a stack of accumulated deltas — angled layers where river sediment emptied into a standing body of water — and yet it was heading uphill. 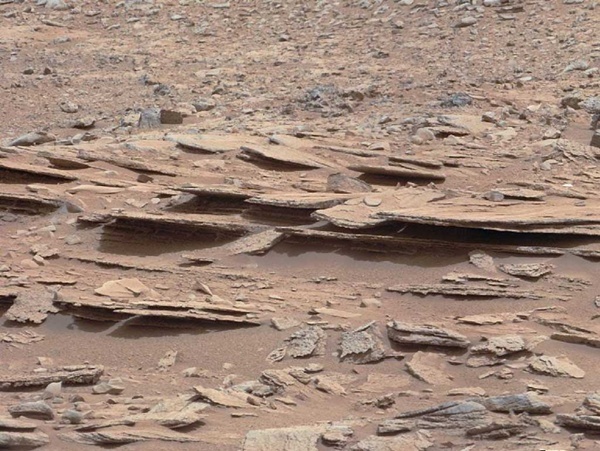 That pattern could have occurred if the water level were rising over time, and Mount Sharp was not there yet. As successful as the NASA Mars rovers have been, their work is limited and slow. Curiosity’s top speed is not quite a tenth of a mile per hour. What might be obvious at a glance to a human geologist, who can quickly crack open a rock to peer at the minerals inside, could take days or weeks of examination by Curiosity. See the full article, with interactive features, here.